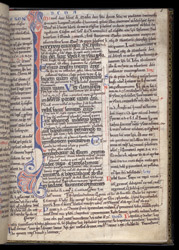 This manuscript of the Gospel of St Mark was made in Durham for Bishop Hugh le Puiset (1153-1195), perhaps the most powerful and influential of the prince bishops. It was a part of a renaissance of manuscript illumination in the Durham Cathedral scriptorium during the 12th century. Here we see the page telling the story of St John the Baptist, "a voice crying in the wilderness". The gospel text is flanked with commentaries by Jerome and Bede, the saintly early historian whose remains found their last resting-place in Durham Cathedral in 1370. Bishop Puiset consolidated and extended the unique princely powers awarded to the bishopric by the Norman kings. At a time of great threat from the Scots - and even one final Viking raid - Puiset combined firm authority with the grandiose showmanship of a great temporal lord. He undertook major architectural and administrative works, and soundly rejected the claim of his nominal superior, the Archbishop of York, to oversee the affairs of Durham.